Vicki Goldberg is a writer and lecturer on photography and art. Her many books include The Power of Photography: How Photographs Changed Our Lives, Light Matters: Writings on Photography, and Margaret Bourke-White: A Biography. Her articles have appeared in many publications, including the New York Times, Vanity Fair, Smithsonian, American Photo, Art in America, ARTnews, and Aperture. As a thinker and writer on photography, she has no peer. Her many awards include the Missouri Honor Medal for Distinguished Service in Journalism from the University of Missouri School of Journalism, the Dudley Johnston Award from The Royal Photographic Society, and the Infinity Award for Writing from the International Center of Photography. 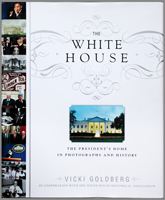 Her latest book is The White House: The President’s Home in Photographs and History. Done in cooperation with the White House Historical Association, it is a rich, picture-filled history of America’s most famous residence and a delightful read. What was it about Margaret Bourke-White that captured your imagination? VG: I knew zero about Bourke-White before I got an assignment early in my writing career to write about the sale of her house some years after her death-only the second article I’d ever written having anything to do with photography. Research revealed a woman who was indomitable, had a formidable career, and perhaps most impressive of all to me at that time, had fought Parkinson’s with determination and bravery. Her photography was impressive enough and not well-known back then, but from what I gleaned about her life, it appeared to be at least as groundbreaking and inspirational. And, I later learned, influential-a model for many women photographers who were encouraged by her success. In her day, Margaret Bourke-White was a lone woman in a man’s profession. Many things have changed. What barriers remain for women in the photographic field? VG: If a woman wants to report and needs to travel extensively to do so, family is a barrier. (But then, photojournalism has become a difficult profession for men and women alike with the shrinking print media.) Balancing career and children is difficult for anyone, probably more so for women. Even so, it’s obviously no longer just a man’s profession. Cindy Sherman is one of the best-known names in the art world, Annie Leibovitz is probably the best-known photographer the world over. Bourke-White’s early marriage and divorce led her to put career first. Today women are expected to shoulder both family and professional lives, and face many tough choices. Can you comment on this? VG: I have no advice, think everyone has to make her own choices in life, and every choice, no matter how right, comes with costs of what’s left behind. I do think that women in an art field have a trifle more leeway-they can usually maneuver their work hours more readily than those with full-time jobs. In today’s world anyone with a camera phone can document historical events. How does this change the traditional role of the true documentary photographer, one who has studied and honed their craft and developed a strong visual style? VG: News is more threatened than traditional documentary, but documentary has been in a kind of limbo for some years as newspapers and journals died, cut back on photo essays, or shifted toward celebrities. Documentary photographers today generally have to fund their own endeavors, which isn’t easy. Some qualify for galleries, which have broadened their outlook; some for books, which oddly enough keep being produced; some have branched into video, which can provide a TV outlet; and almost anyone can get work onto the web-and get paid nothing for it. Still, prominent documentarians have put a lot of their work on the web. Incidentally, there is much more space for documentary in Asia (China, for instance, and I think Korea) than in the west. How has the digital revolution changed photography? VG: Like most revolutions, this one has made things both better and worse. Better for non-professionals: the “average€ person can now make a pretty good photograph, in focus, etc., and visual literacy has increased sufficiently so that many an amateur can turn out pictures that are a good deal more than acceptable. Worse: we don’t have filters that can distinguish quality, avant-garde (if that still exists), or almost anything else from the morass of okay or okay-plus photographs out there. Better: citizen journalism, which has been around a long time, has turned many more people into reporters and made more events visible. Worse: photojournalists have more competition than ever. Better: fewer toxic chemicals in printing. Easier adjustments to tone, color, etc. Worse: this has put the seal on distrust of photographs. Urgent with news, not so urgent with art, but it has created a new relationship to photographs, which now often come with a question: is this photoshopped? Is it staged? Better: even an unknown photographer can make work available worldwide. Worse: zero dollars for this, and quite possibly zero audience. Better: it’s possible to self-publish a book of photographs, though marketing is not so easy. Worse: photographs are so omnipresent and over abundant that there’s a tendency to overlook them, to glance at rather than look at them. More difficult: authorship and copyright are both threatened. Interactivity and “sampling€ may become the norm. And new technologies could bring new revolutions in their wake: the Lytro allows the viewer to change the focus on someone else’s image, an operable camera that I don’t believe is yet on the market can see around corners, and experiments are being done on implanting cameras. Margaret Bourke-White was born in 1904 in the Bronx. Beginning as an architectural and industrial photographer in Cleveland, she was recruited by Henry Luce to work for Fortune Magazine, then LIFE, where her photograph of the Fort Peck Dam graced the first cover. She had a talent for being on the spot when history happened, photographing the Soviet Union in the early 30′s, the dust bowl of 1934, the Depression (paired with writer Erskine Caldwell), World War II, and Mahatma Gandhi just before his assassination. An early marriage to Everett Chapman ended in divorce, as did her second to Erskine Caldwell. She died in 1971 from complications of Parkinson’s Disease which she had endured for many years. With a life as dramatic as her images, she blazed a trail for women photographers, and inspired people worldwide.